A few points first. I always wear all-leather, have wide feet, am not worried about the weight (those are half the weight of my Gronells). I've owned various hiking/mountaineering boots. I'm an experienced hiker. And I replaced the insoles. I wear a liner inside my hiking socks. I have a problem spot on the base of my pinky toe that usually requires to be punched out. Now, the review. I can NOT find anything negative about them. The Asolos were perfect on a 59-km hike through steep mountains of NorthWest (I took them brand-new). Soles are comfortable but hard enough to protect your feet. Great ankle support. I walked through many bogs with gaiters, Asolos, and sno-seal. I'm considering buying another pair to keep for the future. 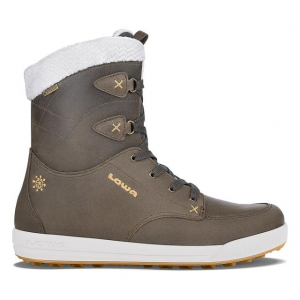 Excellent long lasting comfortable boots. I bought my first pair of these boots more than 10 years ago and they hiked all of the Long Trail and more. I carry from 25-30 lbs on 2- to 4-day overnight hikes. My old boots are beat up on the outside, but still very usable and have been put on consignment at my local gear shop. As I have aged, my foot size has changed, so I have purchased another new pair of the exact same boot one size larger, with the Goretex. Instantly comfortable. Looking forward to many years of use and these boots taking me many miles on future trails. Fit: With a green Superfeet footbed, my heel stays in place and it feels great. I have arthritis in my feet, so this is a big deal. I thought my hiking days were over, until I got these boots and the proper footbed, and then I hit the Long Trail and did the whole thing. Amazing! The lacing is easy to use and adjust. Excellent ankle support and great Vibram gripping sole has saved me from a nasty accident many times. Comfort: Minimal break-in time. I wore the boots around town for a couple of weeks and then hit the trail. My feet get tired as they would on any hike, but I don't get blisters. No chaffing or friction if tied so the heel stays in place. Support: Excellent. Very well designed for support while still allowing needed ankle bend while climbing rocks. Water Resistance: I have slogged through "Vermud" on the Long Trail up to my ankles and no water from outside got inside. Keep the leather treated for best results. Traction: Excellent, great grip on rocky climbs and descents on Mansfield and other peaks. When rocks are wet, beware as you would with any boot. Temp Control: Nice and toasty in winter, with one pair of wool socks. Good in cool spring and fall. I did find that they were too warm in high summer, but I use lighter hiking shoes for warm weather. Ease of Use: Easy on and off. Easy to care for with SnoSeal or other recommended leather product. Brush off the dirt, slick on the stuff and go. Features: I have been very happy with my boots for over 10 years. Love them. They got more comfortable over time until my feet got bigger from age, so I got the same boots again a couple of weeks ago. Took them out hiking this past weekend and they are great. I like the way dirt, leaves, twigs can't get in but they are easy to take on and off. Nice soft leather inserts around the tongue. Construction and Durability: I have used my old boots for over 10 years and they are going strong. I would still be using them if my feet had stayed the same size. Someone can probably get another 10 years out of them. I wore them HARD and got them muddy and wet and dinged up on rocks and they are still in good shape. The soles wore a little on the heels, but otherwise the Vibram soles are fine. Conditions: I used these boots for over 10 years, on the Long Trail in wet, snow, mud, rocks, winter, spring and fall. I have hiked in them and also used them for snowshoeing. No problems, no repairs needed. The lacing system and leather components are fully intact. Can't believe how great these boots hold up. Price: I got these boots for just under $200 at EMS in 2003. I got the new pair in Oct 2014 for a little over $200 at EMS. I would say I have gotten my money's worth and more. They are well worth the price. Welcome to Trailspace, Carol! Thanks for sharing a great review of your boots. It sounds like they have done well. I'd love to see a picture of them in your review, if you're willing to add one. Docking half a star only because I've had them for less than a year, which I don't think is long enough to call this a perfect boot. But so far — they're perfect. Chose to not get the Gore-tex 520 as I do a lot of hiking in the summer when the added heat is the last thing I want. But, as I live in Seattle, why on earth would I ever get a non-GT boot? Because the leather is bomber, and all you need to do is treat it with Nikwax and you're good to go. I've snowshoed, postholed, hiked in the rain, mud, and streams. It's good, we're all good here. If you know you want Gore-tex, then of course, get the Gore-tex. If you're not sure you need Gore-tex... then you likely don't with these boots, they rock. Soles peeled off after ten days walking. 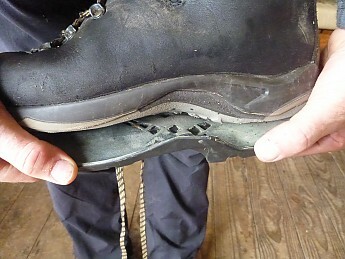 I had just completed the first week of a two-week trip in the NZ backcountry and found that the soles of both boots were peeling off. I had to abandon the trip. They had been properly cared for in the meantime. I'd had them for only a few months and had walked a total of 10 days in them. Welcome to Trailspace, John. Too bad about the boots ruining your trip. Were you able to get any service from Asolo? Yes - they gave me a full credit. I've now had 4 pairs of vulcanised/glued boots fail on me so I've now bought some Hanwag double sewn boots from Germany. They are going well. Good luck with the Hanwags! I hope you'll share a review of those someday too. Hum, I still have mine for over 15 years now, wasn't the same sole. Soory for your trip ends. Brilliant boots. Easy to break in. Superb soles. Quality leather. Best ankle support ever. Got a pair of these in 2005 as I was preparing for a trip to Nepal and Tibet. I was wary of using my very heavy Mendel Super Cracks. The salesman in the outdoor shop in Killarney told me, "These boots don't need wearing in. Just put them on, walk around the shopping centre and come back to me. I'll bet you'll want them!" — a typical 'soft-sell' from a Kerryman! But he was right! A month or so later I was off down the snowy Kailash valley at 4,000m. and hiking up the rocky trail to the monastery with these beauties on. They were excellent — easily worn in and super comfortable. Good strong soles with superb shock absorption and brilliant ankle support. Toes do scuff a bit. Brilliant in mud, snow and over rocky ground. Perfect balance of stiffness and flexibility in all the right places. I have a very dodgy left ankle and these boots took perfect care of it over all sorts of terrain. I find them the best boot at home in Ireland too, well able to handle bog, rock, mud and track as well as the cold and wet. You need to keep the leather treated and seams well waxed up. Even the acid water of the boggy mountains of Ireland couldn't kill them! I still have them and will be wearing them this weekend on a 24Km hike! Brilliant boots! Welcome to Trailspace, Paul! Thanks for sharing your boot review with us. I'd love to see some pics of your pair, if you're willing to share them in your review. 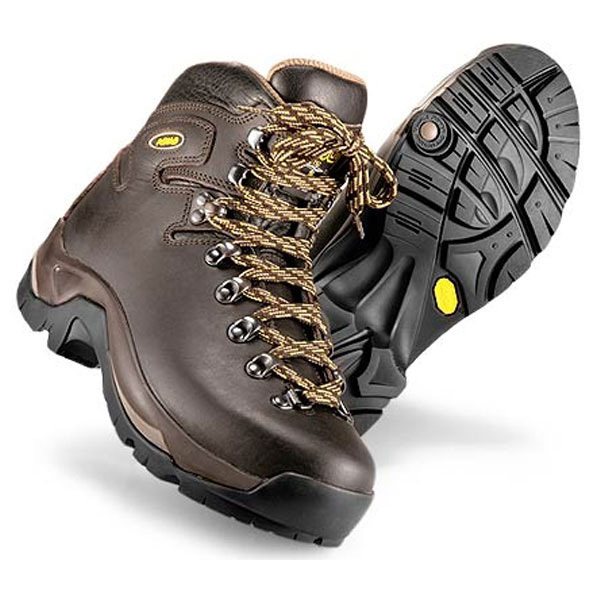 These are excellent general use boots, good solid construction, quality materials. The lacing system is excellent, with good locking abilities. With some TLC they should last for a number of years. Fit of the boots is excellent. They are a little stiff to start with but soon wear in. The ankle support offered is very good, soles are — rigid ‚ for clambering over rock, roots and debris. With proper preparation these boots have excellent water proofing abilities while allowing for adequate temperature control. These are the second pair of these boots I have brought, I like them so much. They have become my de facto Go- To brand and type. This boot is comfortable right out of the box and offers a "wide" option which is even more comfortable. The boot overall is very durable. It's definitely one of the better boots in this price range on the market. I recently tested these on a two-day trip coupled with Smartwool hiker socks. Waterproof: Kept water out very well. Never worried about a leak. Appearance: Classic look with new technology. Insole: Needs to be upgraded. 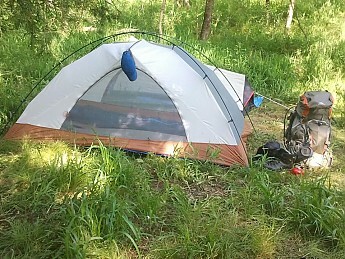 As stated earlier, I tested these out on a two-day, 19-mile backpack trip at Greenleaf State Park in Eastern Oklahoma. I carried a 39 lb pack. The terrain was rocky. It was muddy in the morning but dried up well in the afternoon. There were some good steep ascents and descents. In short, I felt like they were tested well. I wore them for about two weeks daily to break them in for this trip. They are slightly heavier than other comparable boots, but I think that has to do with the better built construction. They kept water out great at crossing streams. I wish they had a toe cap. The only part that looks roughed up is the toe. They do clean up well though. They were comfortable until about mile 10. They could use a better insole. I plan on upgrading that very soon. I felt like I was hiking on a very stiff insole. I had to watch my step in the slick wet rock. They did not feel as stable as other boots I have had. That was the Con list so now the Pro list. These boots make you feel that you can go anywhere. They feel indestructible. I was looking for a boot with a classic look and these are it. I like the all leather. They provided great ankle support. I never had to worry about that. The toe makes it feel that it rolls your foot forward for you making each step easier. Overall, I enjoyed this boot. With an upgraded insole, this boot would be near perfect. Now... where is the next trail marker? Good looking boot. Tough to break in. I have always liked Asolo boots. I got the 535 for backpacking and hunting. They are a great boot but very rigid and hard to break in. The outermost layer of leather treatment scuffs off easy too. After a couple trips the toes of the boots are pretty scuffed up. These boots are very well made and I expect they will last several years. These boots breathe well and my feet stay comfortable in them. The traction on these boots is very aggressive and I never worry about slipping in them. They provide great ankle support! This was the week's top review? Really? With a typo in the first sentence and, later, errors in grammar and a misspelling? How bad were the others? Thanks p_a_lloyd. I appreciate the congrats. And CatskillDeke...... I will certainly make sure I write my review as if I were writing a doctoral dissertation next time just so you can understand the review. I appreciate your feedback and the fact that you have nothing better to do than complain. Get a life brother.... You would think a person with your superior intelligence would figure out the winner is drawn at RANDOM, not necessarily how grammatically correct their review is. Next to your eyes, you feet are the most important. Next to your eyes, you feet are the most important. Don’t skip on weight here, pay the $ now or pay the price later. Shoe laces need to be cords. I don’t “buy” the Ultra-Light Hiking thing; I do however invest in and choose with consequences, keeping in mind the “suffer on the trail” vs. “suffer at the campsite”. Before, I used to take off my boats and switch to my campsite sandals before river crossings, after watching my friend cross with his Asolo’s, I never wore anything else (2 pairs over 20 years). I can tell alot about people in the non-hiking world with the shoes they are wearing. The same goes when I see people hiking, they all have different personalities, styles, and packs I cant see into. With 1 look at their shoes, unless they are wearing levies, if they have Asolos on, I dont need to second guess everything else they are talking about. I bought this shoe to replace a heavier and hotter hiking boot. I find it to be very comfortable and would recommend it to anyone who enjoys hiking or simply walking outdoors. 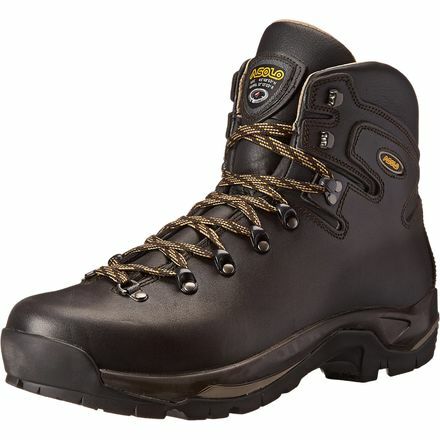 I purchased this pair of shoes to replace my Asolo GTX Fugitive hiking boots. I found these boots to be light weight for a full leather boot and breathable; so much so that I wear them in the summer as well. I conditioned and waterproofed the boot and now I can submerge the shoe in water with only a little water leaking in at the seams at the bottom sides of the tongue. To me this is much better than having a Gor-Tex liner. This way my feet stay much cooler and dryer (due to sweat be able to evaporate). I wear these shoes hiking winter or summer and if I will be out walking for long periods. I have carried a 40lb pack and my feet did not hurt after the hike. I also found the break-in period to be very short. I have worn these shoes for over a year now with moderate use and they are holding up very well. I keep them cleaned and conditioned so they still look new. Nice boot. Only problem is that there are only a few folks who can properly resole the TPS model. I am with ya on the non-GTX thing. Try a little Seam Grip on the area(stitching) where the boot is leaking. This may take care of that. Thanks Rick. I'll try that. I have a narrow foot and this boot fits incredibly well. My old boots (rest their soles) were hard to give up, but change was a good thing with these boots. Minimal break in time made for a several great hikes without foot worries of any kind. My weak ankles never felt unsupported for a week in the Frank Church. I have long been a fan of Merrell boots since 1993 when I bought a pair in Sister's Oregon on a Monday and climbed South Sister on the following Tuesday. I had no blisters and no issues. I had the same experience with two more pairs until the last pair I bought three years ago for a Grand Canyon trip. About 400 miles on them and they are still not right. Eight days ago I had foot surgery and have been barely able to walk. A Grand Canyon hike is coming up in October and I bought my son a pair of ASOLO's for the hike. He and I wear the same size and after only six days since surgery I tried his boots on and I could walk with out pain! I have eight quarter inch laser cut holes in my foot and these 535's are so comfortable I cannot feel any pain! I went out and bought a pair for myself and I will report back after I log fifty miles. The reviews I have read said these boots get better after break in, I cannot imagine how that is possible? I first reviewed this pair of boots on June 23, 2007. Nearly four weeks of use and 85 miles they continue to impress. The lacing system is very effective and adjust well when tight spots turn up. No blisters and only one hot spot on the ball of my left foot that has been resolved by wearing two socks on that foot. I am currently hiking in Rockwood Reservation on the Greenrock trail that winds up and down steep Ozark hills. The boots grip extremely well on the rocky soil and protect well from any bruises. An amazing boot. Comfy and no blisters. 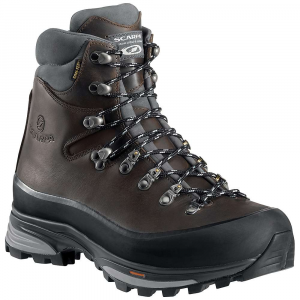 Great in mud and wet conditions, and sturdy support for scrambling and trekking. make sure they fit your feet. Although they may fit at first, I had issues with my baby toes. Like many boots made in Europe where feet are a bit more narrow, there wasn't enough room at the toe. They were sore every time I hiked more than four hours. If they fit your feet, you'll absolutely love them. I wish I could keep mine. These boots were comfortable from the get-go. Three season boots that served me well on backpacks and alpine ascents. However, after 5.5 years and following an October blitz up Grays and Torreys the sole seriously separated from the upper leather. I won't hesitate buying a second pair. Comfy right out of the box, beefy vibram sole, I like 'em. Break-in Period: not very long--easy break in. Love the boots. I have been backpacking and horsing around in them for three years now. I exerienced minimal break-in and foot stress. Have one problem--the toe rubber comes apart from the boot far before the boot is worn out. I had another friend have the same problem w/these boots. If it weren't for this, I'd rate this boot a five+ for sure. It'd be cool if Asolo would remedy this problem. I'm in the market for another pair but am torn as to whether I should buy them again. I think I might--along with a big tube of super-glue. I recently completed a month long NOLS course with these boots and can't say enough good things about them. I left having only barely broken them in having hiked 10 miles in them. Wearing them every day and averaging about 5 miles per hiking day, I never had a single blister with only minimal foot care (taping 2 hotspots for 3 days). Many companions on the trip had trouble with boots falling apart, the two of us who had this boot were probably the most worry free students on the trip when it came to foot health. 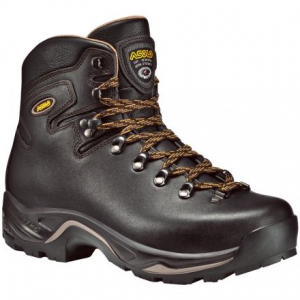 These boots also dry relatively quickly and are extremely reliable in standing water. Unless water goes over the top of these boots (even if they aren't tied) you're not getting wet. Paired with a good set of gators you're not going to get wet until you're wading through a river. 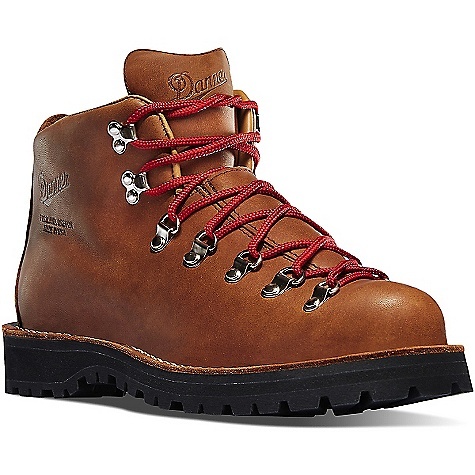 I highly recommend these boots to anyone loking for serious backpacking boots. The Asolo TPS 535 is not available from the stores we monitor. It was last seen September 15, 2016	at Moosejaw.